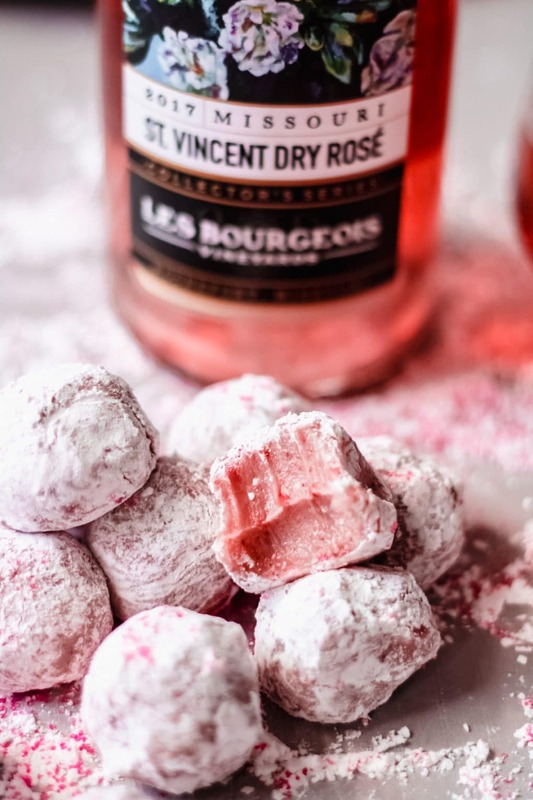 Say yes way, rosé with these white chocolate strawberry rosé truffles. 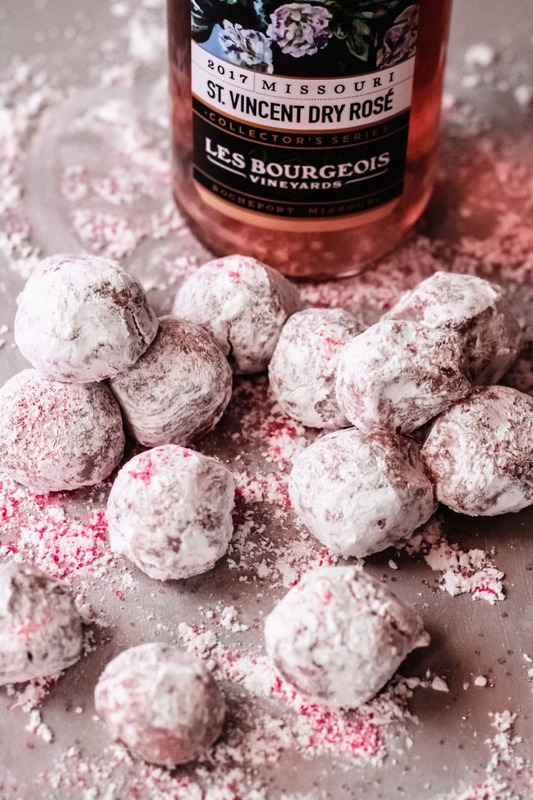 Perfect for Valentine’s Day, wedding showers, or your next rosé tasting party, these white chocolate strawberry rosé truffles are sure to be a crowd pleaser. If you’ve been around here for a while, you know that my favorite wine is rosé! So, of course I’m going to bring you a delicious rosé dessert during my partnership with Missouri wines! These white chocolate strawberry rosé truffles are gluten-free and are another super simple dessert you can throw together easily. The longest part of the truffle making process is the refrigeration process to get the truffles chilled enough to roll into balls. So, while you’re waiting on that, enjoy a glass of rosé on me! What type of rosé should I use? 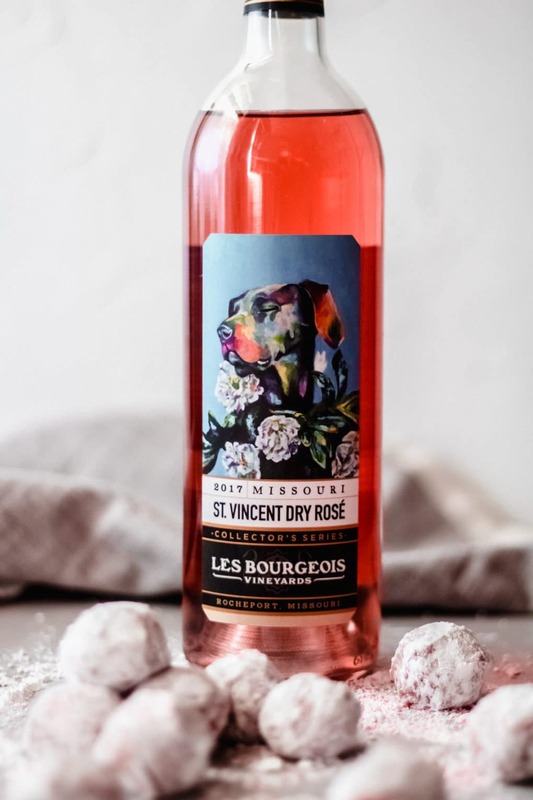 For this white chocolate strawberry rosé truffle recipe, I’m featuring the St. Vincent Dry Rosé from Les Bourgeois winery in Rocheport, Missouri. Because the white chocolate can be so sweet, I recommend using a dry, non-bubbly rosé. You do not need to use a double boiler to melt the chocolate. If you cannot find freeze-dried strawberries, you could swap in freeze-dried raspberries. They need to be freeze-dried for this recipe, not just dehydrated. If you need a dairy-free option, you could swap in full-fat coconut milk for the heavy cream. 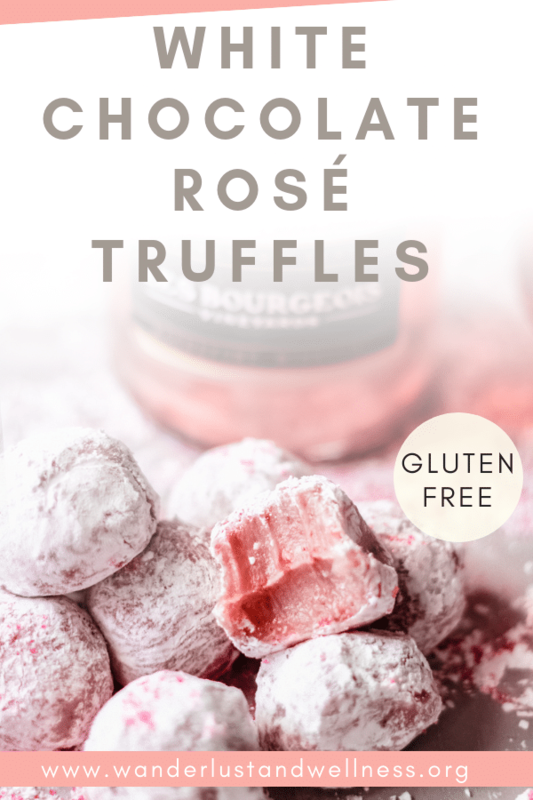 Grab your girlfriends and say yes way rosé with these white chocolate rosé truffles featuring Missouri wines. In a medium-sized saucepan, add the white chocolate, butter, heavy cream, and salt. Melt over medium-low heat, stirring frequently. While the chocolate is melting, add the freeze-dried strawberries to a food processor and pulse. You want to reduce the freeze-dried strawberries down to small pieces. If you don’t have a food processor, simply place the freeze-dried strawberries onto a sheet of parchment paper, cover with another sheet of parchment paper and crush using your hands or a rolling pin. Continue stirring the chocolate until it’s completely melted. Add in the strawberries and rosé and stir to combine. Transfer to a mixing bowl, cover with plastic wrap and place into the refrigerator to solidify for about 2-3 hours. Once the truffle mix is solid enough to scoop out and roll into a ball, remove from refrigerator and begin the rolling process. Add the powdered sugar to a bowl, then scoop out about 1 Tbsp. of the truffle mix and gently roll into a ball with your hands. Next, roll the ball in the powdered sugar and place onto a platter or storage container. Continue the rolling process until all of the truffle mix has been rolled into balls and covered in powdered sugar. 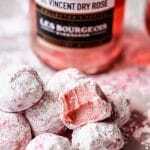 Place the white chocolate strawberry rosé truffles back into the refrigerator for at least 30 minutes before serving. If the truffle mix ever gets too soft, just place it back into the refrigerator to harden. If you need a faster process, you can place them into the freezer for a shorter amount of time. Try these other delicious desserts!